One of the hardest parts of parenthood is those dreaded toddler tantrums which tend to start at the age of two. While extremely common and often just a daily part of parent-toddler life, it can be extremely difficult not to break down and lose your sanity after what feels like the millionth mini-meltdown of the week. If you’re struggling to stay sane don’t worry – there are lots of things you can try to help diffuse the situation. Below you’ll discover the top 10 ways to deal with your tots impressive, yet exhausting tantrums. This is by far the most difficult, yet sometimes the most effective way of dealing with a toddler tantrum. What you need to remember is that it’s normal for toddlers to have tantrums. They are learning their voice and it’s the only way they know how to express their frustration and anger at a situation. Trying to reason with them can be a waste of time. They’re too lost in the moment and they aren’t going to be able to understand your reasoning. So provided the tantrum isn’t hurting anyone, simply ignore the behavior and wait for it to fizzle out. Obviously this is going to be a lot harder in public than it is at home! If you have a young toddler, distraction often works pretty well to diffuse a tantrum. Young children have very short attention spans so offering something to eat, a toy to play with or pointing out something for them to see will often be enough to stop the tantrum in its tracks. 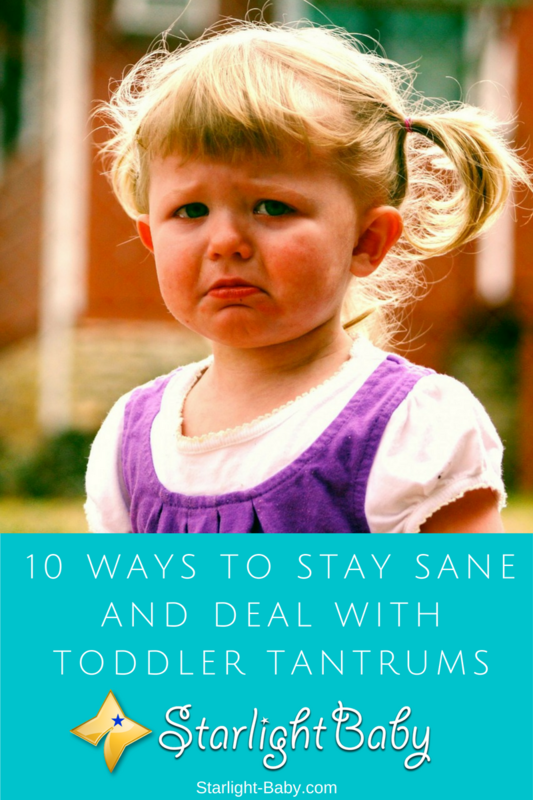 When your toddler goes into full tantrum mode, let’s face it, it’s hard to stay calm! However, it’s also essential if you want to put a stop to the tantrum as quickly as possible. Toddlers, just like babies, pick up on your stress and in turn this increases their own stress levels – therefore making the tantrum worse. Do whatever you need to do to remain calm. Count to 10 (or 100! ), briefly go into another room, give a friend a call, stick your headphones in and listen to some nice calming music for a minute or two; whatever works to calm you down, do it. You’ll be surprised just how quickly tantrums can be resolved if you keep your cool. Having a regular routine is important as it provides a certain level of structure and order to your toddler’s day. They know when it’s bedtime, when it’s time to eat and when it’s time to nap. Many tantrums are brought on by a change, or lack of routine. When you’re just about ready to have your own mini meltdown, it’s easy to consider giving in. Surely just giving them what they want will be worth the peace and quiet you’re desperate for right now? Well, it might be for the next twenty minutes, or maybe even the next hour or two. However, what your child has learnt from their little tantrum when you give in is that it works. So, the next time they want something, what are they going to do? You’ve guessed it – throw another tantrum! Stay strong and don’t give in no matter how tempting it is. As tempting as it may be, this doesn’t mean confine your toddler to an isolated room. Instead, have an area where they have to go to calm down. This could be a naughty step for example. Once there, ignore them until the tantrum dies down. After a while, they will know exactly what the timeout spot means and that the only way to leave it is to calm down. Even the most patient parents find it difficult to not get angry in the face of a full-on tantrum. However, your own anger is simply going to escalate your toddler’s anger and make the situation a lot worse. Tantrums at home are one thing, but having to deal with a toddler tantrum in public can be really embarrassing. The thought of your little one kicking off in the middle of a crowded store can cause sheer panic. The logical thing to do is to be extra nice to ensure they are happy and content with no reason for them to start up a temper tantrum. However, they will start to pick up on this. Toddlers, especially older ones, are a lot cleverer than you might think. They soon put two and two together and realise just how afraid of their tantrums you are. Don’t think they won’t use this as an advantage to get what they want. So avoid treating them with kid gloves and being over-nice and just act normal. One of the main things toddlers need, but struggle, to learn, is to share. Many tantrums are brought on by selfishness. Sharing isn’t something that comes naturally to young children so if another child tries to take your toddlers toy to play with, it could set off a full-blown tantrum. For this reason, it’s a good idea to teach the sharing concept as early as possible. You can do this by arranging playdates and taking your child to the library. Explain the toys are for everyone to play with. They aren’t going to understand this the first time you tell them. You’ll need to persist and explain it quite a few times before they start to realise what sharing means. If all else fails, try to tire your toddler out throughout the day. Let them run around in the garden, go on walks, dance around together and just do anything you can to help them let off steam. If they’re tired, they aren’t going to have the energy to throw a real, dedicated tantrum! Overall parenting a toddler requires a whole different skill set than parenting a baby! There’s going to be times you’re going to feel like just giving up and having your own tantrum. If you follow the advice above, you should find at least one tip helps to diffuse the situation. It’s just a matter of persistence and dedication. And hey, if you have your own tips for dealing with toddler tantrums, we’d love to hear them as well! I feel so blessed that I have never had to experience any major tantrums from my toddler. He is generally really well behaved so I don’t know if that is connected. I fee like the whole parenting and the way you start raising your child can heavily influence on their potential tantrums. If you spoil them and do not set any boundaries while they are still smaller then it will come to haunt you sooner or later – most often in form of tantrums. I have seen plenty toddlers have big tantrums though. It happens everywhere. From shops to the park and so on. I feel really bad for the parent when it happens because they get very embarrassed. It can be very hard having to deal with it. I totally agree with everything you’ve said, Jane. Tantrums really depend on the way we correct our child’s behavior at the earliest time possible. When I didn’t have children yet, I always hated seeing kids throw tantrum at malls when their parents don’t buy what they want – it’s embarrassing and it makes the kid have control over the parent. So wrong. So I promised myself to discipline my child at the onset of a bad behavior. Not giving in and threatening them with a spanking when we get home worked for my kids. It’s a different style for each kid because every child is different. The number three is impossible for me to do, I cannot show or even be 100% calm. Our kids are really smart and know how to get what they want from us, and sometimes is really hard to keep them steady. Your points are very clear and helpful, especially the idea of tire them out! I totally understand your situation. When you become really frustrated with a child throwing a tantrum, you yourself can go “berserk”, haha. Try to do a breathing exercise to calm your nerves even a little. That works for me. And yes, do let us know how things went after you made use of the tips here. Best of luck! Very nice piece of advice for us. Distracting the child at once before it gets to a real, hard to stop tantrum. Let them connect the stories of the books you read to them with the present situation and overact in telling them, like you are the narrator of a children’s show. Get their attention and you will see that in time, they will forget what they are about to launch! This was very effective to me with my daughter and never had a big public show of her tantrums. That’s a great example of providing a distraction before a child unleashes it’s wrath, haha. Thank you for sharing it. I totally agree with your style. Preventing the tantrum is a wise way to deal with it. Keep it up! I really appreciate your advice, but I guess I will really struggle with number one. I’m pretty good at dealing with stressful and difficult situations, so ignoring a toddler would be challenging so I’ll have to constantly remind myself that even the ignoring is part of dealing with the situation. Thank you I feel empowered and greatly encouraged to deal with most of these challenging situations as a parent to be. One of my proven ways to manage my baby’s tantrums is by distracting him. If he begins to show tantrums I will distract him and this works most of the time. For instance, if the baby is showing tantrums because I did not give him my mobile phone, I will give him his favorite toy and he will immediately forget that a little while ago he wanted my phone. You are very correct @vinaya. Kids are very easy to be distracted with another thing when they are really serious with their tantrum over something. Come to think of it, why are babies and kids always attracted to phones? My cousin would know a real phone from a fake toy one, as he would refuse to take the toy one. Getting angry when your kid is throwing up a tantrum for not getting what he or she is asking for wouldn’t solve anything for you but rather it would make things very difficult and unbearable for you. It’s better to ignore them and find a way to distract yourself from their acting up. If their tantrum is causing a scene in a public setting, then you should consider taking them home.